Match Your Trash. 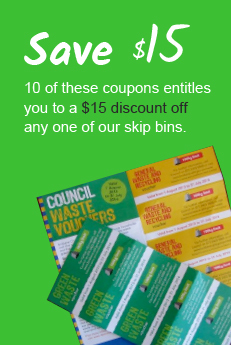 Which Skip Bin should I use? *N.B. All bins delivered have a footprint of 2.5m x 1.7m. Please make sure you have adequate space on your premise for the skip bin. Notes above estimate standard box 7 x 5ft trailer. Ordering Process. How to order? We drop & collect the skip bin on requested days. No drama. No fuss. Easy as. Perfect for no-nonsense, busy people. One phone call sorts it out! 2) Choose either a 4 or 6 cubic m bin to be dropped off. If you have bulky items – white goods, mattresses, sofas, then start with a 6 cubic m bin. If you have a pile of small pieces, household debris, palm fronds, broken down furniture – then try a 4 cubic m bin. We drop on requested date. The day prior to collect (or the 5th day) ring us with the level the rubbish got to, 2, 3 4 or 6 cubic m. Organise credit card payment. We then collect your bin! Perfect for people who are not sure on how much waste they have, budget conscious. Have time to phone office when finished using bin. Selling the house or moving house - you will have junk that you don't want to move to your next home. Renting? If you are renting then its a great time to declutter and get ready for the end of lease inspection. Selling? Many real estate agents recommend doing a tidy up in and around your home to prepare your property and improve the real estate value. Handy tips for Loading up a skip bin. Our skipbins come on a small truck and often we can get the bin under the carport or in the front yard easily. Getting the skip bin close to the rubbish makes loading the bin much easier! The back door comes off so you can pack the bin easily. 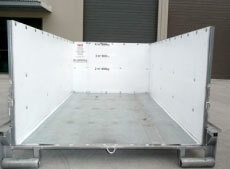 Pictured is a 4 cubic m bin - door off. Footprint of the bin is 2.5m x 1.7m x 1m high. Lie flat any table tops or timber on the floor of the skipbin. Wheel or walk in the awkward bulky items, white goods and brown goods. (dish washer, fridge, washing machines) and lounges. Make your rubbish as small as possible. Break down furniture with a big hammer so it “flat packs”. Crush cardboard boxes. The less airspace you have the better it is! Got paint? Only put dry paint in the skip bin. NEVER ever put in asbestos or hazardous waste in the bin. Huge fines apply and will be directed straight to you! Not all rubbish is rubbish. Sometimes its someone else's treasure. Pop your good stuff next to the bin with a FREE sign. Maybe someone will take it away for you before you pop it in the bin. Simply pay for what you use! If you are not quite sure how much rubbish you have then ask for a Fill-To-Level Skip Bin. Only pay for what you use! That's right! 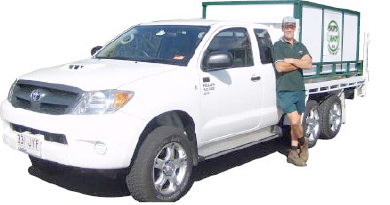 We started servicing the Brisbane area in 1984. And while we are best known for skip hire to the northside & southside of Brisbane we offer a few other services as well. Simply give the girls in the office a call and we can help you with all your waste removal. Skip Bin Friendliness. What can the Skip Bins handle? Contacting us by phone? Easy – we will just ask a few questions to give you the best price we can. First we need to know what suburb are you in. Most of Brisbane and surrounds are a set price but a few far -flung suburbs do have a $20 distance fee to cover the driver’s extra fuel and time. Then we ask what you are putting in your bin. Greenwaste, household, retail and so on. We do have two types of bins and will offer the most suitable bin at the best price for your needs. If you are happy with the price we will go ahead and book you in! Account name, address, contact details, where you want the bin put, and drop and collect dates will be covered off on. We will organise payment method and it’s done! We have wheels on our skip bins! Our skips don’t sit directly on the ground – so don’t worry about the skip bin killing the grass or staining the concrete. The back door opens off and makes it nice and easy to load up. Asbestos can only be removed by licensed transporters. You must NEVER place asbestos in our skip bins. A min. fee of $400 applies if asbestos is placed into our bins.